Developed exclusively for Virtual Reality (VR), Eagle Flight sends you to the skies of Paris to experience the freedom of flying and heart-pounding aerial dogfights like never before! Fifty years after humans vanished from the face of the Earth, wildlife and nature reclaimed its cities, leaving you with a breathtaking city playground in Paris. As an eagle, you soar past iconic landmarks and dive through narrow streets in order to fight opponents and protect your territory. Featuring our VR control breakthrough, you will learn to perform intuitively impressive aerial maneuvers in just a few minutes. With other specific innovations, flying in VR has never been this easy and comfortable. Whether you always wanted to experience Paris from a birds eye view or wanted to live the thrill of hunting like a bird of prey, Eagle Flight lets you fulfill your dreams! Take flight through the skies of Paris with the sound of the wind in your ears and experience absolute freedom as you soar past magnificent landmarks. Hone your piloting skills in single player missions that include ring parkour and shooting challenges. Explore the city to find hidden collectibles and discover hidden passages to gain the advantage in multiplayer! With vegetation taking over its right and wild animals playing hide and seek in the city, experience Paris in a great new setting. Fly through Paris, from the very top of the Eiffel tower to the narrow streets that lead to the Notre-Dame cathedral. 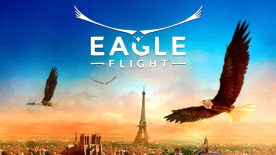 Eagle Flight gives you the absolute liberty to explore Paris from a bird’s eye view! Experience a true multiplayer adrenaline rush with up to 6 players! Use your piloting skills to lead your team to victory in two multiplayer modes. As a bird of prey, you will use the highest point of view to locate opponents and dive towards them to take them down. You will need precision and agility to gain the advantage, and use the city’s narrow streets and secret passages to lose opponents in pursuit. As a result of Ubisoft’s research on VR games, the team developed new flight controls that greatly reduce motion sickness and enable every player to quickly master their flying skills. In Eagle Flight, you control your trajectory by using the motion of your head. Taking full advantage of VR technology, this innovation lets you pilot intuitively with extreme precision while making Eagle Flight accessible to everyone. Eagle Flight was developed specifically for VR with the intention of delivering unmatched flight sensations while offering an incredibly comfortable experience. Thanks to the intuitive controls, high frames-per-second count, and many other developments that greatly reduce motion sickness, Eagle Flight is a full VR game that can be enjoyed by everyone. © 2016 Ubisoft Entertainment. All Rights Reserved. Ubisoft and the Ubisoft logo are trademarks of Ubisoft Entertainment in the U.S. and/or other countries.